The water engineering community has been struggling with new professional liability risk involving the location of premise isolation backflow preventer systems; Not because of new design practices, but because of new information about the old practices. There has been a slow trickle of warnings for years, but in the past 3 years important organizations and industry leaders have added new warnings with much stronger language that not only change recognized best practices, but actually challenge the fitness and safety of older placement methods altogether. And with this new risk realization comes a new interested party: The insurance company. Because of this very public commentary from experts and leading groups, casualty carriers, through subrogation, have new weapons for damage recovery. Any time insurers are able to prove the designer contributed, whether materially or passively, to the poor design, designers, contractors, architects and even local water districts may be at risk for the liability. Well to explain, we need to first talk about the changes that have been happening all over the country regarding RPZ backflow preventers. 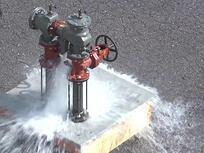 More water districts are requiring them. Lynchburg has required RPZs on all non-residential connections for almost a decade. This includes domestic, irrigation, and fire lines. You can see part of these regulations to right. Click the image to see it larger or click here for the full program information. 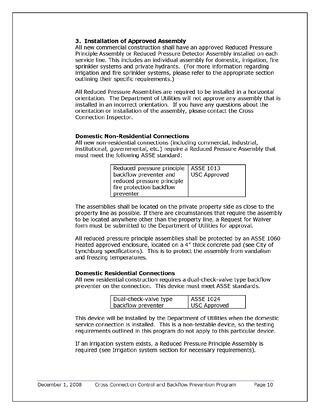 Naperville had already required RPZs on commercial irrigation lines for years, but in 2013 they now require RPZ valves on domestic and fire lines for commercial buildings. In June 2013, Delaware added a requirement for all industrial, commercial, and institutional water services to have an RPZ device outside and above ground in a protective enclosure. These are just a few that we've heard about over the past couple years. Other districts that are moving towards RPZs on domestic lines include Albuquerque, Las Vegas, Long Island, and Seattle. There are undoubtedly more. Now that RPZ valves are often required on at least domestic and irrigation lines, more and more of these reduced pressure zone backflow preventers are showing up. And they show up indoors. What's so wrong with indoor RPZs? Well they are designed to protect the drinking water by dumping contaminated water. For a detailed explanation of double check and RPZ backflow preventers, click here. Basically, to provide more protection than a double check valve can, the reduced pressure zone device has a relief valve. If a double check valve fails, you'll end up with contaminated water in the system. If the valves on an RPZ device fail, it will dump the water to protect the system. That means it's working properly. The problem is that depending on the valve, that may be a surprisingly large amount of water. There are flow rate charts for leading backflow manufacturers online. Here's a link to the Watts graphs. Those numbers don't lie and are straight from the manufacturer. But who wants to look at some numbers when we have a video of this occurring? We set up a 3" RPZ outside to see what would happen in this situation. This is just a small sized device and there would be much more water with a 6" or 8" backflow valve. You can see that from the graphs. These RPZs can cause floods, so much so that backflow manufacturers even sell a "flood control valve." 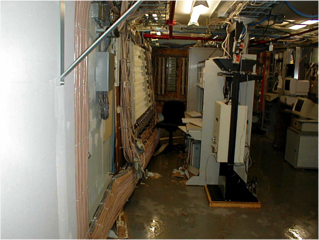 The floods can cause massive damage depending on where the devices are installed. 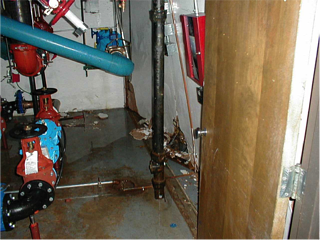 Here's an example of a hospital that had a backflow preventer installed in a mechanical room next door to a room full of telecom equipment. You can see from the pictures that the flood actually pushed the wall dividing them into the next room. There was more than $1 million in damages. Who was to blame and who did the insurance company come after? Nearly everyone involved. This included the engineer, architect, contractor, subcontractor, and even the most recent tester. These things happen, especially in more recent times now that insurers know more about the system. Details about who paid what were not released, but the insurance company was made whole in this situation. want to be on a list of those responsible for flood damages? Of course you don't! So, what can you do? Keep these flange sized RPZs out of the building and out of the mechanical engineer's domain. Encourage your local water district to adopt new details for outdoor installation of RPZs if they do not already have them. Some municipalities have done so in recent years. 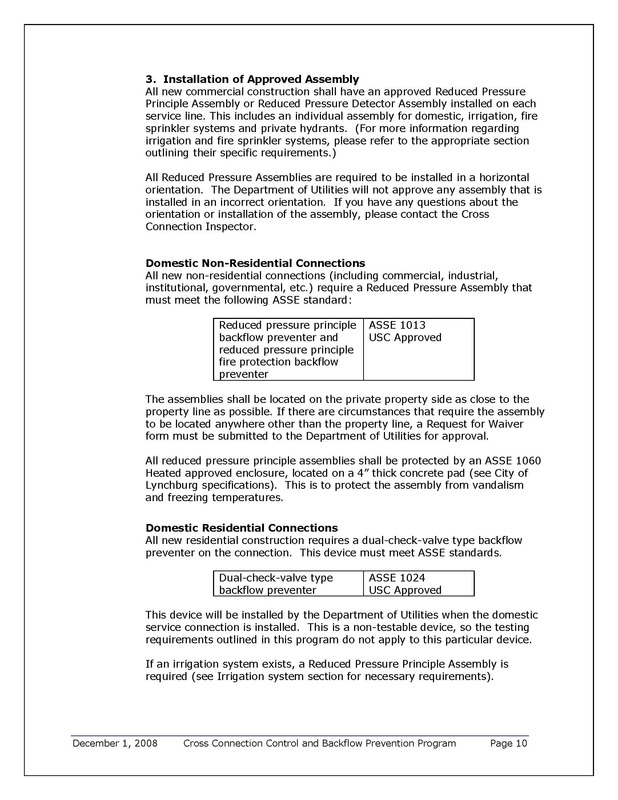 Roswell, GA released new standard details requiring specific drain sizing for indoor RPZs, those that can't comply must place the device outdoors. Denver, CO created standard details for outdoor RPZs in 2013. Continue this momentum by promoting best practices and adoption by civil engineers and water purveyors.